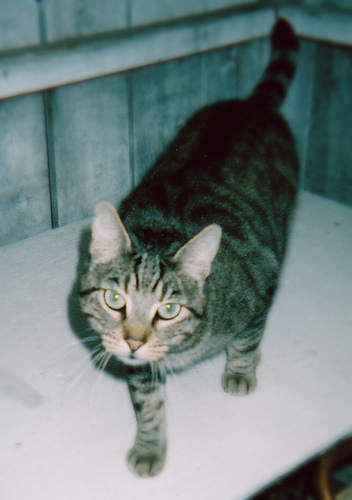 I once had a tiger cat named Antonio. He was a special cat in many ways. One of those ways is that he did not speak. Antonio made his presence known, certainly, but as far as I knew, he could not meow. He would often open his mouth as if he were going to speak, but no, only silence emerged. I had had Antonio several years before I got a catnip plant. Antonio, as cats tend to do, enjoyed the catnip. He and my other cat enjoyed the plant to death – they knocked it from the shelf on the front porch and ate it down to nubs. When I opened the front door the next morning, I spied a broken pot, a pile of dirt and roots, and two tired, marble-eyed cats. I let several years go by before I got another catnip plant. After giving the cats a few sprigs, I put the plant in a spot where they absolutely could not reach it. Lesson: When you want something bad enough, you’ll find the voice to ask for it. Antonio looks a lot like my cat, who I still miss. When I first met her, I thought she couldn’t meow either but she soon let me know that she could and loudly, in my ear, at 4:00 in the morning. And I still miss that too. I love this! So true. And a good lesson for us all. A simple story with an amazing message. I needed that! Last time I was between apartments I took my 2 cats to live with me, a friend, and her 2 cats. Sometimes we’d sprinkle catnip on the living room floor and just sit back to be entertained. Stoned cats are hilarious!